Maddie knows her letters and numbers pretty well. She further understands that when I read bedtime stories to her, I’m reading the words from the page. (Except when I’m faking it, when there are too many words.) And she can even read a few three-letter words herself, like cat and hat. Sometimes when we do something that meets with Maddie’s disapproval, she’ll tell us that she’s “bad to us.” We know that she means either she’s mad at us, or that we’ve been bad to her. We just aren’t sure which, exactly, she means. Today, as we were driving around, and I wouldn’t stop singing along with this Hercules song, I Won’t Say (I’m In Love), even when she yelled for me to stop, she told me that she was bad to me. I was too busy singing to let that bother me. Then Maddie proceeded to calmly explain what the repercussions were. (Furiously) I’m bad to you, Daddy! It’s wrong, but Lillian and I looked at each other, and couldn’t stop from laughing. One of the great delights in having a new baby is that they’re fascinated by you, and they love it when you sing to them. They don’t care if you’re off-key, or if you don’t know the words to the tune. There’s nothing like having a baby to make you break out your inner Pavarotti. Or Bono. Hey, whatever — they love it, it’s all good. For both my children, that seems to be the magic number when my cantorious voice turned into a shrill, grating train wreck. Kids seem to love certain CDs, and that generally means listening to a lot of Wiggles. And after listening to “Old Man Emu” for the millionth time, it’s harder to keep quiet than it is to belt it out along with Greg. As soon as I begin to sing along, both kids in unison shout, “Stop!” And if I don’t stop right away, they actually begin to cry. That’s right. I’ve made my children cry by singing along to the Wiggles. No joke. Here’s the part that only other parents can understand: And somehow, it’s still fun. Even if now it’s only to torture my lovely little cherubs. A few days ago, Lillian and I both started singing a song together only to have both children command us to stop. And we did stop, for the interlude, and we started back again with the chorus, not missing a beat, bolder and louder than before. The kids and I went to the local theme park with one of Maddie’s friends, Nickol. Maddie and Nickol are almost four, so they’re tall enough to go on the kiddie rides. We figured that Aaron would be able to ride with me on most of the rides, so we’d all have fun. Maddie and Nickol found a kids-only ride that they loved, and wanted to go on it a couple of times. Aaron wanted to go on it too, but he and I weren’t allowed on it. 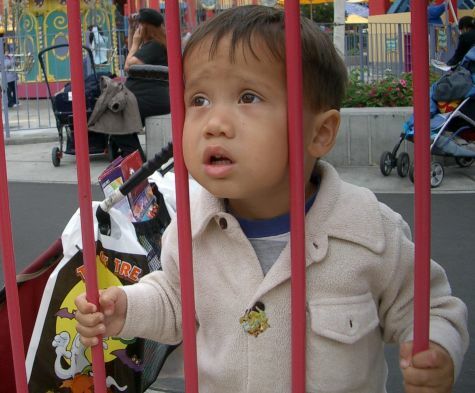 So we waited outside the fence surrounding the ride. I’d gotten a bunch of pictures of the girls screaming and laughing on the ride, but none of Aaron, since he was just standing next to me watching the ride. So I stretched my arm as far as I can over the fence, and snap a shot back at Aaron through the fence watching his sister on the ride. I figured that he’d look cute through the bars. Only later when I saw the picture at home did I realize what it must be like to be a two-year-old at a big kid theme park. Maddie’s favorite workbook is the tracing book by Kumon. We’re going to look for more. The world is in the throes of possibly the most successful marketing campaign of all time: Disney’s Princesses. Maddie has bought into it hook, line and sinker. If a product has a princess on it, Maddie wants it. We thought it would be fun to drive her to Disneyland (about 8 hours) to see Sleeping Beauty’s Castle. We hyped up the trip like nobody’s business, and Maddie couldn’t wait to see Sleeping Beauty’s Castle. We checked Disney’s website, and it said that Sleeping Beauty’s Castle was closed for repairs, but we didn’t think that would be a problem. Just seeing it would delight Maddie. When we got to Disneyland, we discovered what “closed for repairs” really meant. The castle was completely covered and inaccessible. Maddie kept asking to go the Sleeping Beauty’s Castle even while we were in Disneyland. It was hard to explain that the blue monstrosity was it. Once we returned home from the trip, Maddie helped me wash hundreds of miles of dirt and bugs off the car, as I explained to her that if you love something, you want to clean it from top to bottom. I had hoped that she’d make the connection that Mommy cleans her and Aaron from top to bottom, so Mommy must love them very much. In addition to that, it became some comfort to Maddie that Disney must love Sleeping Beauty’s Castle, because it’s getting cleaned from top to bottom, too. A couple of weeks ago, our kitchen sink developed a leak near the trap. I fixed it by tightening a couple of the little twisty things on the pipes that look like they’re meant to be tightened with bare hands. Or so I thought. The leak was still there a few days later. This time, I really tightened those little things with my bare hands, and put a paper towel under the trap to catch any water that might leak. It caught some water. So my wife put a little dish under the leak and we tried to ignore it. Today, we could ignore it no further. I disconnected the little bendy thing, and took it to the hardware store. Trip One: Some disaffected employee told me to get a replacement washer, and handed me the wrong one. I caught the error, and picked up the right one. Two of ’em, just to be safe. I didn’t want to have to come back. Trip Two: I had to go back because the leak wasn’t in the old washer, the bendy trap thing had a crack in it that I’d only just noticed. So I bought a replacement one. …except when we tried to connect the end of the new part to its mate on my broken part, the threads wouldn’t mesh. My part was using some non-standard threading. So I had to replace the mate to the broken part at home. That required buying a hack saw, 10″ of new pipe, the pipe-glue stuff, a connector, and the replacement part assembly. Lillian suggested I just hire a plumber, rather than saw through our plumbing myself. Silly girl! But I wondered if another hardware store might have a compatible replacement part, and that would be so much easier. Trip Four: The other hardware store didn’t have any non-standard threaded trap things either. So I returned home, did my sawing, gluing and screwing and so far, the fix is holding. I’ll keep my fingers crossed. One of my wife’s photos got selected for display at 1000words.net. It’s a photo that we could have almost thrown away, but it evokes a strong emotion in me, and I submitted it to David Chin at 100words. His site is a very cool concept, and I’m honored to have one of our photos displayed there. Of my kids’ four knees, only one does not currently have a band-aid on it. And that’s only because that particular scab is dry enough now. Does this make me a good father, or a bad father? We had a bittersweet milestone this week. Things have been pretty good. My work, my home, and my family’s health have all been fine. I even come home at a decent hour, and try (though not always successfully) to put work behind me, and focus only on my family when I arrive. We have a fun routine, too. I come home, the family eats together, and we go out for a walk around three blocks, and come back to some fresh fruit. After a little playtime, the bedtime routine starts. But this one day, I was tired and had had enough of the kids running around like, well, little kids. They were giggling and having a grand time. But my fuse was short, and I was snapping at them at the slighted provocation. Maddie asked me her first “why” question. Why… Why are you not happy, Daddy? It stopped me in my tracks for so many reasons. I knew right there it was her first why question to me. I appreciated the complexity of the question, too. I appreciated the implication that my natural state should be happy. And I appreciated the fact that my attitude bothered Maddie enough to formulate this kind of question for the first time. I mostly snapped out of it. I drew Maddie closer, gave her a big hug and told her that even though I wasn’t happy right now, I loved her, and I always would. That seemed to make her feel better, and that made me feel better, too. Aaron’s usually pretty good at eating and drinking a variety of foods. Oh, he’ll have his obstinate moments, but generally, he’s a good sport. But lately, he seems to be a lot thirstier than he should be. He’ll have recently finished a full bottle of milk, and then he’ll be asking for “Nai-nai” (Chinese baby-talk for milk) again. Time and again. Now, Aaron’s had a head start on language and vocabulary, because he’s got his big sister to help him out. So we’ve been able to figure out what he’s asking for pretty easily. He knows words like Nai-nai, banana, Poh-poh (grandma), Gai-gai (to go out), Mamma, Daddy, bird, dog, etc. So does he really want all that much milk, or is there something else going on? He gives me, “Nai nai gai gai apple?” with this look of longing. Lillian figured it out: These are comfort words for him. Usually they’re associated with a good experience. So when something doesn’t go right for him, he’ll give the ol’ comfort words a go, and maybe things’ll turn right. Maddie: Daddy! Daddy! Daddy! We got candy! Momma: She doesn’t know what she’s talking about. Maddie: Daddy! We got candy for you! Momma: Maddie, c’mon. What are you talking about? No we didn’t. Maddie: Daddy! Daddy! Daddy! I made a card for you! Momma: She’s just babbling. Now go away and play, honey. Daddy: That’s great Maddie! Did you put it with the candy? Before reading any further, I knew it must have been true. I put the card down and gave her a big Thank You hug.